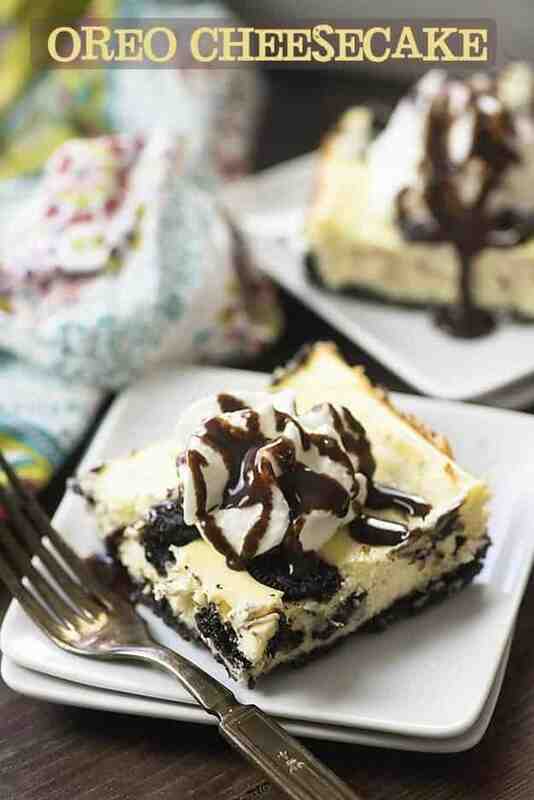 Oreo Cheesecake Recipe - such a simple recipe that's always a hit! 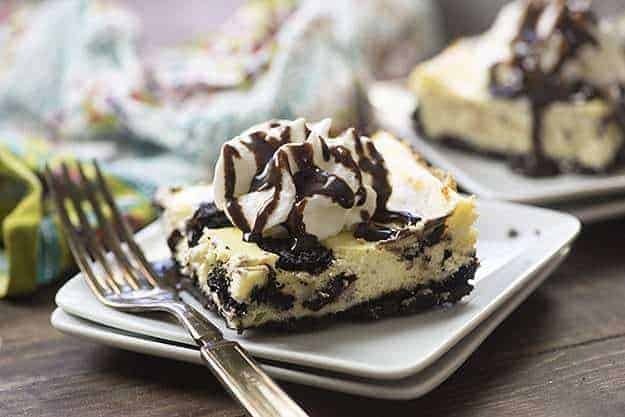 My husband has always been a big fan of cookies and cream ice cream and cheesecake, and I’ve always been a big fan of making him food that he loves. It’s only taken me nine years of marriage to come up with the idea of combining his favorite ice cream with his favorite dessert. I was both pleasantly surprised and quite dismayed to realize that Oreo cheesecake is quite possibly the best dessert out there. Pleasantly surprised because I’m normally not a fan of cookies and cream unless it’s just a plain ol’ Oreo dunked in a big glass of icy cold milk, and dismayed because I couldn’t stop sneaking into the kitchen to take just one more bite. This cheesecake is dangerous. That’s okay though, because life is pretty boring without a bit of danger. The Oreo cookie crust is made out of Oreo crumbs and melted butter. I won’t judge you if you feel the need to double the crust recipe and eat the extra half with a spoon. Oreos and butter go together surprisingly well, not that I would ever know anything about something like that. No, not me. 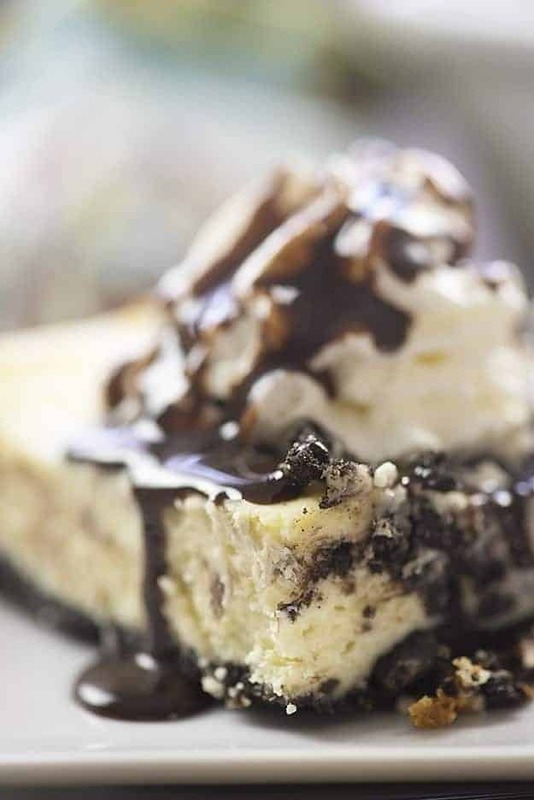 You’ll love this Oreo Cheesecake recipe! 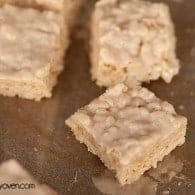 This is a really easy cheesecake recipe and the cheesecake batter whips up quickly. Then you’ll just crumble up some more Oreos and stir them in. Pour the batter onto your crust and imagine how many points you are earning by making your husband such a yummy dessert. 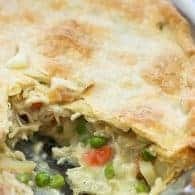 After you smooth the batter over the crust, it bakes in just 30-40 minutes. The hard part is waiting the 3 plus hours for it to cool in the fridge. I left mine in the fridge overnight to be sure it was completely set and chilled through. There’s nothing worse than warm cheesecake, am I right? I made you a video up top to show you how easy this Oreo cheesecake recipe really is! I hope you guys give this one a try and report back! 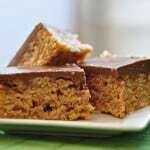 You’ll love my chocolate chip cheesecake bars and sopapilla cheesecake bars too! Give this easy cheesecake recipe a try and let me know what you think! 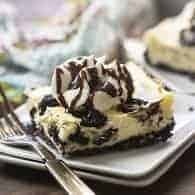 This Oreo Cheesecake recipe is creamy perfection and it's one of the easiest cheesecakes you'll ever make! Check out that Oreo cookie crust hiding out under the creamy goodness, too! Using a food processor, blender, or rolling pin, crush 28 Oreo cookies into crumbs. 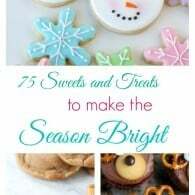 Pour into parchment paper lined 9 x 13 pan and pour melted butter on top of cookie crumbs. 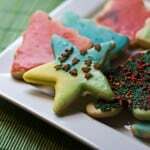 Stir to coat all the cookie crumbs with butter and press into the pan to form the crust. Beat cream cheese, sugar, and vanilla until well blended. Beat in the eggs one at a time, mixing just until blended. Crumble remaining Oreos with your fingers and add to cheesecake mixture. Stir together to combine and pour over cookie crust. Smooth the batter and place in the oven for 30-40 minutes, until the edges are set but the center is still slightly jiggly. Cool on a wire rack and then refrigerate for 3 hours or overnight. There’s a chocolate chip cheesecake dip out there, too. It looks like (well, it is) a cheesball, and it is excellent with those graham cracker sticks. Personally, I have pumpkin cheesecake this week. Storebought. My personal attempt was gross. O.M.G. what I would give for a slice of this cheesecake! Oh my! What a fabulous cheesecake- and so easy to make too! Looks so delicious! I want a piece! 🙂 Subscribing to your beautiful blog now! Wow. Wow. Wow. I’m totally drooling. I think I need to buy some Oreos stat. O wow, yes, well, I can believe that that would be incredibly good! It looks fantastic and I do love cookies and cream, so this will be a winner! Aw haha well that’s good you were able to figure out where the present went! This cheesecake looks really yummy. Oreo ice cream has always been my favourite! Is this what’s also known as Oreo cake? Either way – it looks delicios! Woman, I’ve been reading your blog for about 15 minutes and I’m totally in love. I am desperately wishing for a good oven to work with again so I can try these out! I love your attitude, keep doing what you do amazingly! but ur post might have just changed my mind!! and it looks so easy to make too!! looks fantastic!! one question: for the crust – do u only crush the biscuits of the oreo or u use the whole oreo biscuits including the white filling? This may seem like a silly question but what kind of sugar should you use? Great, thanks for replying so quickly! I don’t know of a good egg substitute in cheesecake.